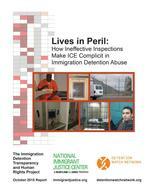 For background on the U.S. Immigration and Customs Enforcement detention inspection system, read the full October 2015 report by the National Immigrant Justice Center and Detention Watch Network: Lives in Peril: How Ineffective Inspections Make ICE Complicit in Detention Center Abuse. 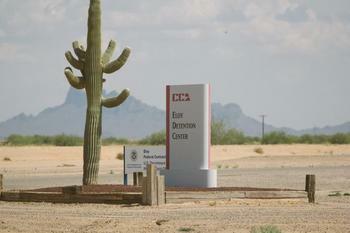 Eloy Federal Contract Facility in Arizona has the highest number of known deaths of any detention facility, including at least six suicides since 2003. Eloy is also the source of frequent reports of sexual assault, and the subject of an investigation launched by Rep. Raúl Grijalva (D-AZ) in June 2015. Under these circumstances, it was expected that the facility’s inspections reports would reveal a troubling history of failure to meet standards regarding medical care, suicide prevention, and sexual assault prevention. Instead, the inspection reports reveal ICE’s complicity in obscuring the facility’s failure to meaningfully address its violations. Based on the inspections reports NIJC received, Eloy has not failed an ERO inspection since 2006. However, ICE did not provide the 2010 ERO inspection for Eloy. It is unclear whether this omission is because the facility was not inspected that year or because ICE failed to fully comply with the federal court order in NIJC’s FOIA litigation to obtain the documents. The lack of accountability under the 2008 PBNDS Suicide Prevention and Intervention standard is apparent in Eloy’s 2012 ERO inspection. Eloy passed on the overall suicide prevention standard despite failing to comply with one of its major components: the suicide watch room was found to contain “structures or smaller objects that could be used in a suicide attempt,” including grates and a sprinkler head. Instead of questioning the judgment of the medical staff who signed off on the room’s use, the inspector marked Eloy as compliant with the next component, which requires that “Medical staff have approved the room for this purpose.” The inspector went on to minimize the concerns about the safety of the suicide isolation room by explaining that “a detainee placed on suicide watch would be under constant observation by a security officer sitting outside the room” but failed to address the requirement that medical or detention staff monitor individuals on suicide watch every 15 minutes. In 2015, questions regarding whether jail staff adequately monitor individuals at risk of suicide became a major focus of the investigation Rep. Grijalva demanded after an autopsy raised questions about the circumstances surrounding the suicide of 31-year-old Mexican immigrant Jose de Jesus Deniz-Sahagun. The inspections documents raise additional concerns regarding Eloy’s suicide prevention efforts and ICE’s attempts to cover up or diminish the facility’s deficiencies over time. One suicide, that of Emmanuel Owusu in October 2008, seems to have been hidden by ICE for years. In a 2010 story about Mr. Owusu’s death in The New York Times, there is no indication the reporter was informed he had committed suicide. A list of in-custody deaths released by ICE in 20121 lists Mr. Owusu’s cause of death as “Acute Cerebrovascular Accident,” a medical term for stroke, but a list released in 2013 and updated in 2015 says Mr. Owusu died from suicide by hanging. The 2009 ERO inspection report does not mention Mr. Owusu’s death at all aside from a tally in the “significant incident summary worksheet,” where two deaths are attributed to “illness.” There also is no indication that the circumstances surrounding Mr. Owusu’s death played into the determination of Eloy’s rating on the medical care or suicide prevention standards. Notably, the Reviewer-in-Charge Assurance Statement, where inspectors discuss deaths on other inspections reports, is heavily redacted in the 2009 inspection. The checklist ERO inspectors use during their reviews does not include all components of the detention standards, a discrepancy that could obscure important details of daily operations which are critical to ensuring humane treatment of those in custody. At Eloy, the ERO inspection failed to recognize that medical screenings and physical exams rarely were reviewed by physicians. According to an article in The Arizona Republic following a July 2015 media tour, Eloy has no doctors on staff. The February 2011 ERO inspection rated Eloy as compliant on all components of the Medical Care standard, but the ODO inspection two months later found the facility was deficient on two points that are not even covered in the ERO checklist: the requirement that a “clinical medical authority,” which the ODO interprets to mean a physician, reviews the medical screenings individuals undergo within 24 hours of arriving at the facility and the physical examinations people have within their first 14 days there. These exams determine individuals’ priority for treatment. The ODO reviewed forms from 30 screenings conducted by registered nurses, nurse practitioners, or advanced practice nurses and found none had been reviewed by a physician; of 30 physical examinations within 14 days of arrival, only one had been reviewed by a physician. The ERO findings regarding individuals’ access to medical care also come into question in light of an October 2010 report by the Women’s Refugee Commission, in which one woman who suffered from multiple sclerosis reported she made repeated requests to see a physician but was forced to wait two months to see a doctor about her condition. The 2011 ERO inspection was the first time Eloy was in compliance with the sexual assault prevention and intervention standards. This inspection report is notable because at least two sexual assaults (which later would become highly publicized) took place at Eloy in the 14 months prior to the inspection. Unfortunately, inclusion of the standard does not guarantee that a facility is held accountable for preventing sexual assault. The ERO inspector notes 10 allegations regarding sexual assaults at Eloy in the past year, then dismisses them all as “unfounded or unsubstantiated” and refers the reader to a database for additional statistics. ERO’s failure to ensure compliance with the sexual assault standards means facilities are not held accountable and those in custody remain at risk. Tanya Guzman, a transgender woman who was held in an all-male pod at Eloy, was assaulted in December 2009 by a guard who later was convicted. Despite the first assault and Ms. Guzman’s frequent complaints of harassment and abuse, Eloy continued to detain her in the male pod and she was assaulted by another detainee in April 2010. She reported the assault to the police a week and a half later, saying she waited because she feared retaliation. She was released from ICE custody soon after making the report—likely the reason her claim was not substantiated in the records the ERO inspector reviewed. In December 2012 the ACLU of Arizona filed a lawsuit on Ms. Guzman’s behalf against ICE, Corrections Corporation of America, and the City of Eloy regarding the 2009 assault.